There are lots of great reasons to be animal free, but more specifically to stop eating meat. Here are some reasons you might like to consider when trying to decide whether you want to make the effort to become vegetarian. 1. Many of us today suffer from high cholesterol. This is often because of the saturated fat in our diets, much of which comes from meat and other animal products. There is no cholesterol in vegetables. Even things like avocado and nuts which seem fatty contain mostly mono-unsaturated fats. Cutting out the meat in your diet will cut your cholesterol intake over night. It is also the case that meat and animal products can be very salty, and a plant based vegetarian diet can be a low salt diet. 2. Vitamin deficiency can cause many health problems and many people are deficient in vitamins in their diet. Meat is not high in vitamin content and you need a properly balanced diet to get all the correct vitamins and minerals essential to good health. By cutting out meat and switching to being vegetarian, with grains and soya for protein, you are almost guaranteed to get all the vitamins you need. 3. Many people are concerned about GM (genetically modified) foods which they feel may have unwanted side effects that we are not certain of. For the same reason it may be advisable to reduce the amount of animal products we consume. Most of the recent food scares such as salmonella in eggs, CJD in cows and so on have been focussed on animal products, and it is the case that modern farming techniques mean that most animals are exposed to hormones, antibiotics and countless other chemicals in their feed, or being injected to keep them healthy or of increased size. Of course crops are also treated with pesticides, but by switching to organic vegetables you can avoid man made chemicals in food to a large extent. 4. Most doctors now recognise the link between health and diet. Cancers, heart disease, diabetes and obesity are all affected by diet. A diet rich in vegetables and grains is the healthiest way to eat, and is full of cancer combating anti oxidants. A diet high in animal products is not generally thought of to be a healthy way to eat, meaning that being vegetarian offers definite advantages. 5. Large amounts of meat slows the metabolism. It is hard for the gut to digest and sits in the intestine for a long time. 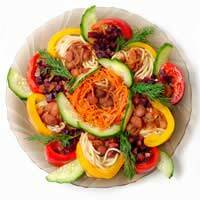 In contrast a vegetarian diet is high in fibre and much easier for the gut to process. It helps clear unwanted fats and other wastes in the intestine. Also, the stomach needs millions of bacteria to help it stay healthy and work properly. A high meat diet tends to destroy the bacteria making us feel sluggish, whereas being vegetarian doesn't. 6. Animal products tend to have a much higher calorie content than plant based foods. You might be surprised by how much weight you lose without really trying if you switch to a vegetarian diet. 7. Most people think of themselves as animal lovers but do not think twice about buying meat at the supermarket. We are removed from the processes that turn the animals we care about into meat for our consumption. However it is not hard to research what happens to animals who are intensively farmed for meat production. If you do genuinely care about animals and dislike the way animals are farmed, the best way as a consumer to let people know is to vote with your feet and become a vegetarian. By switching to a vegetarian diet or to 'freedom food' as recommended by the RSPCA, you are sending a clear message to the producers. 8. We are constantly told that there is not enough water in this country and we are often subject to drought orders. Meat production is high on water consumption. It takes three or more times as much water to produce animal protein as it does to produce plant protein. By switching to a vegan or vegetarian diet you are helping to conserve water. 9. Meat production is also energy intensive. With resources running out we all need to think about ways in which we can reduce the energy we use. We burn more calories of fuel to create meat than we get in return, as compared to the production of grain. It is also the case that cattle eat more grain to feed fewer people than if the people ate the grain themselves. 10. Greenhouse gasses. Global warming is a reality that is affecting our planet every day and a large percentage of those gasses come from the animals we farm. By reducing the numbers of animals, we reduce the gases, so by turning vegan or vegetarian, you directly help lower greenhouses gases. There are lots of great reasons to be vegetarian, but in the end the best reason to be vegetarian is that you will feel better - not just for your contribution to society, but in your own body.